Siddhant's parents are educated. His father has a job in pharmaceutical company. His mother does not have any skills and thus has to do the jobs that are available. Siddhant is a healthy boy and was found to be mentally and physically active upon admission. Siddhant has 1 school going sibling. The income of family is not sufficient to take care of 2 children and 3 adults as the grandmother stays with them. 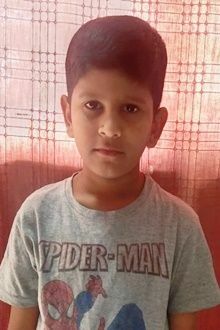 Many a times the needs of Siddhant are not given priority and thus he is included in the sponsorship. Tell your friends Siddhant needs a sponsor!